Windchill LCC - Relex Italia S.r.l. uses reliability information to calculate a product’s cost-of-ownership. PTC Windchill LCC offers industry-standard cost-breakdown analysis tools and a flexible equation editor supporting a range of variables and functions. By combining customizable cost-breakdown structures with user-defined equations, the software can accurately predict a product’s life cycle costs. An integral module within the PTC Quality Solutions suite, it also enables manufacturers to compare the cost impact of several alternatives side-by-side, calculate sensitivity and net present value (NPV), and forecast costs throughout the design, production, repair, and disposal phases of a product’s life. Comprehensive Analysis. Windchill LCC supports parametric, analogy, bottom-up, and direct cost analysis calculations. Results include total lifetime cost, sensitivity calculations and Net Present Value (NPV). Windchill LCC is most powerful when leveraged with other reliability analysis tools. Link failure and repair rates from Windchill Prediction, or availability and downtime costs from Windchill RBD, to dynamically include these often overlooked costs. Professional Outputs. 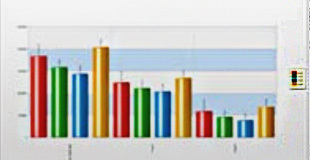 Windchill LCC is supplied with a range of industry standard reports and graphs. Easy-to-use Report and Graph Wizards provide complete user customization of outputs to fit your specific needs, without the need for IT experts. Once complete, reports and graphs can be printed or saved directly to Microsoft Word or Excel, and Adobe PDF. Cost Breakdown Structure. Windchill LCC provides an intuitive interface to create a Cost Breakdown Structure (CBS) that meets your company or industry needs. Account for many different types of costs, including design, production, warranty, repair, and disposal. Use the flexible, built-in equation editor to define cost equations and variables to calculate very detailed repair costs up through high-level system cost.